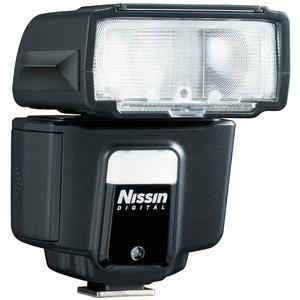 The pocket-sized Nissin i40 weighs only 7.2 ounces, and it is suitable for filling shadows on even the sunniest of days, for family shooting, indoor/ outdoor shooting and especially suitable for traveling. Professional functions include: Wireless TTL mode; up to 1/8,000 seconds shutter speed; Flash output of GN40 at 105mm; Video light function with 9 steps of output level adjustment; Simple operation panel with two selector dials to operate the flash; Flash head tilts up and rotates horizontally to right and left for making bounced lighting more versatile by utilizing more angles. A detachable diffuser is supplied. The Nissin i40 has two selector dial controls: Function dial and Power dial, which make it easy for beginners to quickly get started. 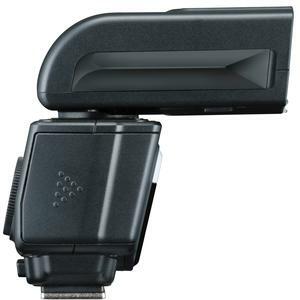 The flash head rotates horizontally 180° to right and left and tilts up 90° which is suitable for close up photography. It also makes bounce shooting more versatile with a variety of potential angles. 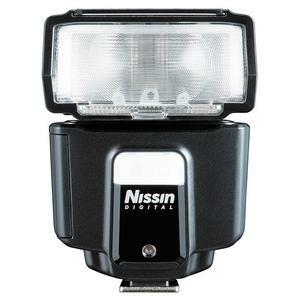 The Nissin i40 features a video light function, which has 9 steps of output level adjustment. The Nissin i40 supports 24-105mm auto zoom. 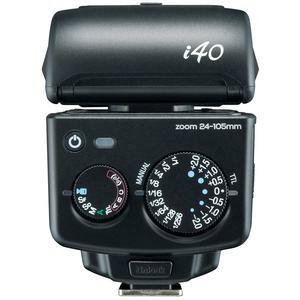 Manual Zoom is available in M, SD, SF, and Wireless modes. Supports up to 1/8,000 seconds shutter speed. The i40 requires 4 AA batteries (not included) for simple, convenient power that is available anywhere. The i40 features a durable metal hotshoe design with a quick release button, making it easy to install and reducing the chance of damage from repeated use. Use the included diffuser to soften the flash and reduce shadows, ideal for use as fill flash at close distances. The i40 can be used as a wireless remote flash system as a slave unit. You can enjoy creative flash photography with multiple light sources from various directions. There are 2 slave modes provided. 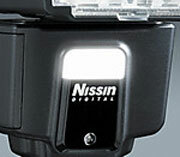 The power of the flash can be controlled with TTL flash level compensation. Whereas total exposure is controlled by the camera's EV compensation function, the flash can compensate for the exposure on the main subject only, with little impact on the exposure of the background scene. The flash power level can be adjusted from -2EV through +2EV by 0.5EV steps.